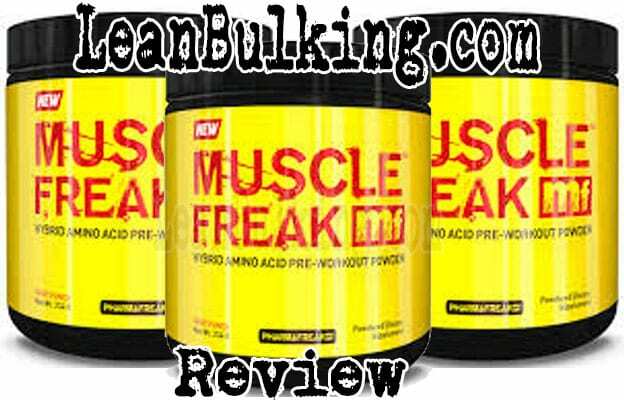 PharmaFreak MUSCLE FREAK Review | Pre-Workout | Does It Work? 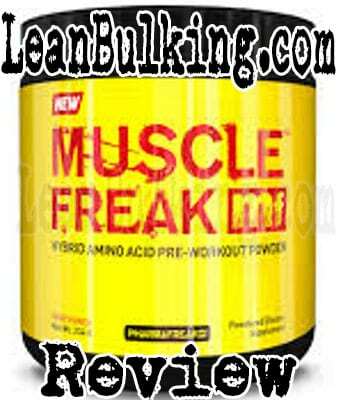 MUSCLE FREAK is a pre-workout supplement released in 2017 by PharmaFreak. It costs $39.99 for 30 servings and comes in 1 flavor - Fruit Punch. Not a bad asking price, so it'll be interesting to see whether MUSCLE FREAK contains good ingredients in optimal doses (which is what really impresses us). PharmaFreak are a supplements company founded in 2008, based in USA. They're not very creative with their product names, sticking 'Freak' onto every single supplement (such as their fat burner 'Ripped Freak'). Let's see what MUSCLE FREAK is packing under the hood. MUSCLE FREAK contains 7 main ingredients and is designed to promote muscle protein synthesis (gains), while also improving your gym sessions. We always prefer specialist products, and believe pre-workouts should only aim to improve your workouts, by improving your strength, endurance, focus and energy levels (which are the key benefits, why else would you buy a pre-workout supplement?). But we're always open to new products to prove us wrong - let's see whether MUSCLE FREAK contains the right ingredients to deliver the key benefits. While this ingredient can reduce cramping, apart from that, it's not very impressive. People believe it improves energy levels, as it's in energy drinks such as Red Bull - but studies have shown that it has no effect on your energy levels. In fact, Taurine's shown to do the opposite and help you relax, which is the real reason why it's added into energy drinks; to help keep you calm after consuming stimulants such as Caffeine. 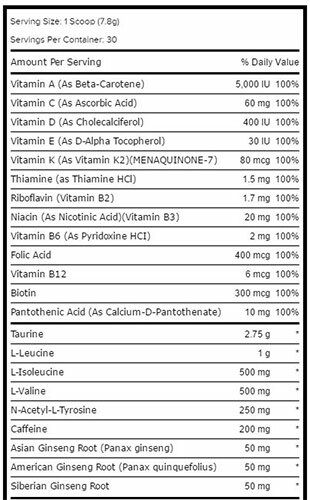 We consider Taurine as a bonus ingredient, rather than a key one - there's nothing negative about having this in MUSCLE FREAK, but we would've preferred ingredients such as Creatine Monohydrate here. There are three Branched Chain Amino Acids (L-Leucine, L-Isoleucine, and Isovaline), and these have shown to promote muscle protein synthesis (gains). However, we prefer to consume BCAAs after our workout (protein powders contain all 3 BCAAs), so this is more of a bonus ingredient in a pre-workout. We would happily replace BCAAs with Citrulline Malate anytime in a pre-workout supplement; Citrulline Malate's shown to enhance your muscle pumps in the gym (which is one of the key benefits of taking a pre-workout supplement). L-Tyrosine's a 'brain booster' ingredient that's shown to improve your cognition (memory and focus). There's no negatives to having this MUSCLE FREAK, but as Caffeine also offers this benefit, there's no need for L-Tyrosine here. However, we find it useful in non-stimulant pre-workouts that don't contain Caffeine. Caffeine is one of our favorite pre-workout ingredients for one reason - it works. It's consumed everywhere, everyday in products such as tea & coffee - meaning it's also proven to be safe. But one thing we always look out for is the dosage of Caffeine in supplements. We're happy that PharmaFreak haven't gone over-the-top with Caffeine in MUSCLE FREAK, choosing to add a sensible and effective 200mg; this will be beneficial to both those tolerant and sensitive to Caffeine, without causing side effects. If you're in doubt (or don't consume 2-3 cups of coffee per day), then we recommend consuming a max of 200mg Caffeine per serving in a pre-workout supplement - this will ensure you're safe from jitters and energy crashes. While this is one of our favorite testosterone boosting ingredients, it's not as effective in a pre-workout. Basically, the main benefit of taking Asian Red Panax Ginseng is experience a rise in testosterone levels, but this isn't a key reason why you'd buy a pre-workout supplement (this is exactly why testosterone boosters exist). We always say that Usain Bolt wouldn't get in the pool with Michael Phelps - so there's no need for a pre-workout to try and boost your testosterone levels. For this reason, Asian Red Panax simply isn't needed in MUSCLE FREAK. These 2 types of Ginseng Root are believed to offer the same benefits as Asian Red Panax Ginseng, but studies have shown that they're not as beneficial. Not only that; as we've mentioned above, there's no need for American or Siberian Ginseng Root in MUSCLE FREAK. We're happy to see that PharmaFreak didn't add hide any ingredients in proprietary blends in MUSCLE FREAK - it's great to be able to see the dosages of each ingredient, and knowing exactly whether they've been dosed optimally. As a result, MUSCLE FREAK doesn't seem likely to cause any side effects; 200mg of Caffeine won't put anyone in danger of experiencing jitters or energy crashes, and the other ingredients haven't been reported to cause side effects. After having bad experiences with PharmaFreak's other supplement (a fat burner called Ripped Freak), we're happy to see that they've learned from their mistakes; they didn't make the mistake of adding proprietary blends in MUSCLE FREAK, and dosed the caffeine perfectly at 200mg per serving. However, we would have liked to see more key pre-workout ingredients - especially Creatine Monohydrate & Citrulline Malate. For this reason, we believe a 2.5 star rating is a fair judgement of MUSCLE FREAK. While MUSCLE FREAK might promote muscle protein synthesis (gains). We would’ve preferred enhanced muscle pumps in the gym (which is one of the main reasons we consume pre-workout supplements) – unfortunately, MUSCLE FREAK doesn’t contain any ingredients to deliver intense pumps. For this reason, we don’t believe that it can beat the best pre-workouts on the market.